I was fortunate to know Ray quite well, I visited him at his home in Ivanhoe, where his back yard ran down to the Yarra River, and the house was replete with many of both his paintings and sketches. Alas his wife Thelma had died at this stage. We both had service in the Royal Australian Navy as a common interest, Ray joined as an 18 year old and I had been part of the Class of 1936, 12 of us just 13 years old. Two of my Naval College term served in HMAS Perth as Sub Lieutenants, Jack Lester unfortunately died in the Battle of Sunda Strait, but Norman Knocker White survived his time as a POW of the Japanese. This is a monster of a book, 672 pages plus a 100 reproductions of Ray’s paintings and sketches, but it never lags, as Pattie covers Ray’s fascinating life with lucid prose. She has captured the essence of the man, dependable, self reliant, well read ( considering he left school at 15,) a shrewd observer of life at war, a philosopher, a gifted writer with his trilogy and the prize winning HM Barque Endeavour. Ray was a great artist, his paintings and sketches recorded the harsh and brutal side of being a POW of the Japanese, but he loved nature, and painted vivid butterflies, insects, and native flowers he found in the jungle close to the Thai/Burmay railway that he was forced to build with his fellow prisioners. As a senior Petty Officer in HMAS Perth, his action station was the cruiser’s Quartermaster, two decks below the bridge in the Lower Steering position, his ear glued to the voice pipe for wheel orders from the Captain or Navigator, he competently steered the ship, if ever a nasty situation prevailed, his Captain HEC Waller would call on Ray to man the helm. Pattie has recorded Perth’s sinking and the open boat saga covering some 500 miles as Ray in command of this open boat, notwithstanding it also carried 4 Officers, sailed his way southward hoping to reach Australia but ending up on an island, to be captured by the Japanese. Knocker White is Ray’s Mr. Wyatt. Ray had an unusual friendship with Lieutenant Colonel Weary Dunlop, although a Doctor, his leadership qualities stood out so muh that he was the Commanding Officer of some 1,000 Servicemen, including the survivors from Perth, all involved as slaves building the dreaded railway to Burma. Colonel van der Post made up the third member of this trio as they discussed books, mused on philosphy, life etc. Ray and his wife Thelma adored each other, and their love kept him going in tough times, believing he would survive the war and go home at its end to his beloved Thelma. And so it happened. After working on the railway Ray was taken to Japan with his mates, and forced to work in Japanese coal mines deep under the sea. This is both a unique and wonderful book mainly about the LINE, and those who slaved to build it, the struggle to survive the brutal Japanese regime. Many of the British POW’s did not survive like the Australians did, they all looked out for each other, and worked together to survive. 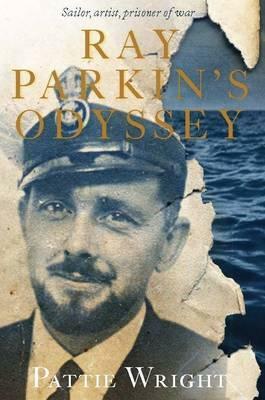 Do yourself a favour, grab a copy Ray Parkin’s Odyssey, revel in its story as you quickly turn its pages enjoying this life of a true gentleman. Congratulations Pattie Wright on a job superbly done, I highly recommend this saga.